It's nearly Halloween and I'll be the first to admit that I'm a wimp and don't like being scared. I love movies that offer suspense and surprises, but I don't care for the ones that get in your mind and instill fear in you long after you watch them. There are plenty of movies in the horror genre. I don't think the ones about serial killers, chainsaw wielding psychopaths, or monsters are that scary, but I do get spooked with the more subtle supernatural stuff like ghosts. The first movie I remember being scared of was Willy Wonka and the Chocolate Factory. I saw it in the theater with my parents when I was a little kid. They ended up taking me out to the lobby. I'm not sure if it was the Oompa Loompas, watching kids get picked off, or Gene Wilder's hair, but something was just wrong and scary about that movie. It should not have been classified as a children's movie. Here is a list of horror movies that have since scared me. Since I'm not a big fan of this genre, I admit I haven't seen very many scary movies so my list is limited. Psycho- This is a classic. The concept behind this movie has been copied quite a bit since then. I miss the subtlety and suspense that Hitchcock featured in his movies. 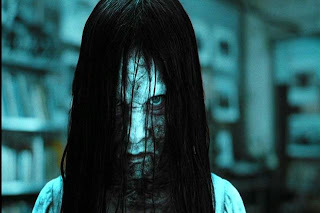 The Ring- I never thought a little girl could scare me so bad, but I wet my pants when she crawled out of the TV. The Exorcist- I've only seen parts of this movie. Whenever I am flipping channels and come across Linda Blair's spinning head, I just keep moving on. The Shining- All work and no play makes Jack a dull boy. Nosferatu-The original from 1922 and Klaus Kinsky's 1979 German version is also great. Salem's Lot-Several things about this movie freaked me out. It was no fun walking home from my friends house after it was over. Poltergeist- I've never looked at clowns the same after seeing this movie. Nightmare on Elm Street-This movie had a scary premise. I only saw the original so I can't vouch for any sequels. Alien(s)- One of the few " monster" movies I think is extremely intense and scary. What Lies Beneath-The real horror in this movie is that Harrison Ford plays the bad guy for a change! The 6th Sense-My wife's family all slept in their living room after watching it because they were too afraid to sleep in separate bedrooms. The Others-Not that scary, or original, but I still liked it. Diabolique-I'm referring to the original 1955 French version. Very suspenseful. Invasion of the Body Snatchers- Both the 1956 original and the 1978 remake were pretty good. I love the concept of people not really being who they appear to be. The Haunting in Connecticut-Makes you want to get a very detailed history of a home before you buy one. What are some movies that have kept you from wanting to go down in the fruit cellar at night? PS- This post was borrowed from The Movie Guy. At least this is not your job. Over the years I have realized that some people don't enjoy what they do for a living. Some of them hide that fact, but others make it painfully obvious that they don't like their job. I'm sure many people who are competent employees would totally excel with a different occupation. Paul Potts previously selling cell phones comes to mind. What if Michael Jordan would have decided to become an insurance adjuster instead of a basketball player? I'm sure he would have been great at what ever he chose to do, but we would have missed out on his basketball talents. At least he didn't stick with the baseball thing. I'm sure there are many people who wish they could do something else for a living. I also have a feeling more of those buried desires are aimed at the entertainment industry as opposed to the science field. I bet a lot more people strike out for Hollywood on a bus with their last 50 dollars hoping to catch a break than people who head out to MIT to see if they can impress someone and become a famous scientist. Does that mean Hollywood has less substance to it if just about anyone who is ambitious enough could break into it regardless of their experience level or talent? I'd say yes. Under the current economic conditions people should be grateful to have any job, but I am especially happy for those people who enjoy what they do for a living, regardless of what their work is. I think it's good advice to go into a field that you enjoy. By the way, if any of you happen to know of any openings for positions in the NBA, or for work as a movie critic, comedian, or food critic, that doesn't really require that you are good at it, I'd love to hear about it. I hear it's all about who you know. I really hate to see waste, especially when it comes to something as dear to my heart as food. Many supermarkets, grocery stores, and businesses throw out large amounts of food on a daily basis. I think it's a shame to see food wasted when there are so many hungry people who would gladly accept it. I know many stores donate their day-old bread and other foods to homeless shelters or food banks, but they still end up throwing away a lot of food that is beyond the expiration date due to liability concerns. I have always been a picky eater and am sensitive to eating food once it is beyond its prime. I frequently turn my nose up to and decline perishable food items if I suspect they might be tainted or unsafe to eat. That being said, I have no problem eating foods that are a little past the expiration date, especially if they are canned or dry goods. It's kind of a no-brainer. I know to pass on the green hamburger in the back of the fridge with the white cotton like coat growing on top of it, but if some packaged and processed food is a little past the "best by" date, then who cares? I hope that doesn't make me sound like I'm a food hoarder or a dumpster diver. Not me, but I could be that guy's stunt double. One of my saddest and most recent food wasting memories happened when I was eating at Arby's. 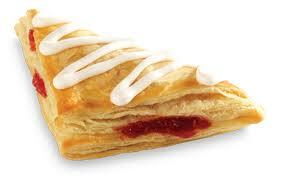 I placed my order for a couple items off the dollar menu and, while I was waiting, a new teenage employee had just finished icing a tray of warm cherry turnovers. As he was loading them under the heat lamp with the tongs, one of them slipped out and fell several inches onto the clean stainless steel counter top below and it smudged a little of the icing on top. He picked it up and did the unthinkable. Without hesitating, he tossed the perfectly good turnover into the garbage, as time stood still and I cried out in anguish, "NOOOOOO" in slow motion. As the turnover sank into the bottom of the trash can, I sank to my knees then collapsed into the fetal position and sobbed uncontrollably. Yes, they really are that good. I guess it's a good thing employees are trained to discard food that doesn't meet quality standards, but it's not like it fell on the floor. He just smeared a little frosting. Note to Arby's: If you expect me to ring that bell when I leave, then I expect you to offer me any of the less than perfect-looking turnovers your new employees may have screwed up before you discard them.